A gang who posed as police to kidnap a man who they tortured for 18 hours in a "depraved attack" have been jailed. David Kelly, John Hayter, Liam Field and a boy, who cannot legally be named, faked the arrest of the 33-year-old on Merseyside in July 2018. The man was taken to a park, and later a house, and beaten with metal sticks, stabbed with a machete, burned with an iron and doused with boiling water. At Liverpool Crown Court, they admitted false imprisonment and other offences. 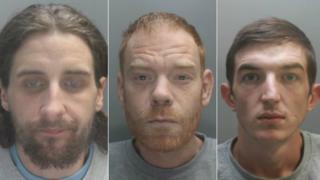 Merseyside Police said the gang were trying to "extract cash" from their victim's family. A force spokesman said after faking the arrest on 27 July 2018, they took the man to a Whiston park and assaulted him, before moving him to Hayter's house on Woodhurst Close in Huyton, where he was handcuffed to a chair and tortured. He was found by police with burns, cuts, lacerations and a fractured arm. Speaking after sentencing, Det Ch Insp Ian Warlow said it had been "a sickening, premeditated and sustained assault" which left the victim with "multiple injuries" and "psychological scars [that] will last a lifetime". The planning put into the "depraved attack" and the fact it was done "to extract cash from the man's loved ones only makes it more shocking", he added.